Gov. 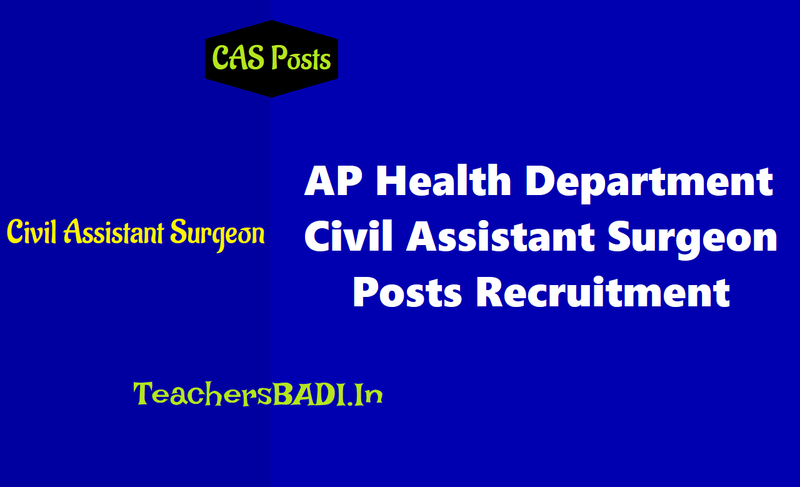 of AP, DPH&FW - 1171 Civil Assistant Surgeon Posts Recruitment and Last date to apply is 25.10.2018 : Applications are invited from the eligible candidates to the posts of the Civil Assistant Surgeons in Primary Health Centers under control of the Director of Public Health and Family Welfare, Andhra Pradesh, Gollapudi, Vijayawada and CAS under the control of the Director of Medical Education, AP, Vijayawada on Regular basis. How to apply: Filled in Applications shall be submitted on or before 25-10-2018 by 5.30 PM, at O/o Director of Public Health & Family Welfare, A.P., Gollapudi, Vijayawada. The applications received by this office after due date are summarily rejected. The department is not responsible for any postal or other delays. DPH&FW - Civil Assistant Surgeon Notification. APVVP - 190 Civil Asst Surgeon Specialist, Dental Asst Surgeon Posts (Last date: 31.10.2018): Govt. of Andhra Pradesh, Andhra Pradesh Vaidya Vidhana Parishad invites applications for the posts of Civil Assistant Surgeon Specialists and Dental Assistant Surgeons in APVVP Hospitals under the control of Commissioner, APVVP on regular basis. Qualification: PG Degree, Diploma, DNB. Age as on 01.07.2018: 41 years. Andhra Pradesh Medical & Health Services - Recruitment to the posts of Civil Assistant Surgeons under the control of Director of Public Health and Family Welfare and Director of Medical Education, A.P., Vijayawada - Selection Procedure - Orders - Issued. G.O.Ms.No.105, HM&FW (B.2) Department, dated: 16.07.2013. From DPH&FW, A.P. Vijayawada, Lr.Rc.No.38279/E6.D (Rec.CAS)/2014, dt.19-7-18. The Director of Public Health and Family Welfare, A.P., Vijayawada shall take necessary action accordingly. This order issues with the concurrence of Finance (FMU-HM&FW-II) Department vide their U.O.No.FIN01-60021/37/2018 (Computer No.607783). VACANCY POSITION OF CAS UNDER DPH&FW, A.P. Age Limit: Minimum age: 18 years and Maximum Age: 39 years for OC and 5 years relaxation for upper age limit for SC/ST/BC and 3 years for ex-service Men and 10 years for Physically Handicapped Persons up to a maximum for 45 years. The maximum age shall be reckoned as on 01.07.2018. 1. Notification will be issued by the District Medical & Health Officers concerned and recruitment will be done at the district level. Receipt of applications, Scrutiny of Applications, display of Merit list , selection list , conducting counseling and issue of appointment orders will be done by District Medical & Health Officer under guidance of District Selection Committee headed by District Collector. ( Appointment orders in case posts in APVVP Institutions will be issued by DCHS). 2. Selection is based on Merit and Rule of Reservation. Out of a total of 100marks, 90 marks shall be allotted against marks obtained in the qualifying exam and 10 marks against waiting period @1 mark for each year of waiting after completion of MBBS course, subject to a maximum of 10 marks as on the date of Notification. 3. Rule of Reservations will be followed as per the Rule 22 of AP State and Subordinate Services. Candidates may obtain prescribed application forms from the O/o the Dist. Medical & Health Officer, Concerned District free of cost. 3. The following documents are to be submitted in the following order only. 3. Attested copies of MBBS Marks memos of all years and Provisional Certificates, Internship Certificate and Permanent Registration of APMC. 6. Attested copies of study certificates from Class–IV to X where the candidate studied. 7. Attested copy of latest Physically handicapped certificate (if applicable)/ Ex-Serviceman. i) If attested copies of Caste certificate / Physically handicapped certificate / Ex- Serviceman are not enclosed, the candidate will be treated under OC. ii) If the certificate copy of Residence or the Study certificate is not enclosed the candidate will be treated as Non-Local. iii) If attested copies of the above are not enclosed, the application will be summarily rejected. iv) Application shall be submitted in the format enclosed to these guidelines only. 1. Conditions on Appointment: The candidate selected and appointed on contract basis shall not be regarded as a member of the service in which the post to which he/she is appointed, is included, and shall not be entitled by reason only of such appointment, to any preferential right to any other appointment in that or any other service. The department or the person may revoke the contractual appointment or discontinue the contract by giving one month’s notice in writing on either side. This contract would automatically cease to operate on lapse of contract period and both parties will be discharged of their respective obligations and liabilities without any formal or informal communication. 2. Tenure: Initially for a period of one year from date of joining in the post. 4. Basic pay of Rs 40270/-(PRC 2015)( As per GO Ms No 459 HM&FW department Dt .22.05.2002. 5. Leave: The persons appointed on contract basis are entitled to Casual leave on par with regular employees in the department and Maternity leave in respect of female employees for 180 days without any remuneration and not entitled to any other leave. 1. No private Practice is allowed during the contract period. 2. All the CAS shall maintain bonafied head quarters. 3. Department reserves the right to transfer the contractual employees to any other station due to exigencies of work or administrative reasons. 4. Disciplinary control in accordance with provisions of APCS (CCA) Rules, 1991. 5. All persons appointed on contract basis shall execute an agreement on a non-judicial stamp paper of Rs.100/- with two witnesses, and submit the same to the appointing authority concerned at the time of reporting for duty, agreeing to the terms and conditions of the contract.